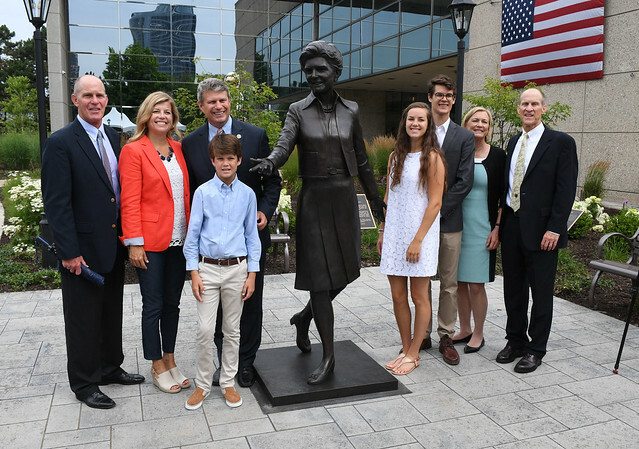 A statue of Mrs. Betty Ford was unveiled at the Gerald R. Ford Presidential Museum in Grand Rapids, Michigan on July 14, 2018. Sculptor J. Brett Grill designed the statue, which was made possible through the generosity of the Peter F. Secchia family as part of the Grand Rapids Community Legends Project. The Secchia Family launched the Grand Rapids Community Legends Project in 2008 to encourage education about local legendary citizens and to celebrate those that built the community. In all, the Secchia Family will support a series of 25 bronze statues which previously included: city founder, Lucius Lyon; first female CEO in the U.S., Anna Bissell; boxing legend Stanley Ketchel and others. Joseph Becherer provided opening remarks and highlighted the tremendous work by the Secchia Family. Becherer is the Chairman of the Grand Rapids Legends Project and Chief Curator & Vice President of Frederik Meijer Gardens & Sculpture Park. He noted that the statue is a gift to the Gerald R. Ford Presidential Foundation for display at the Gerald R. Ford Presidential Museum. Don Holloway, Curator of the Gerald R. Ford Presidential Museum, thanked Peter and Joan Secchia for their gift on behalf of the Museum. Trustee Steve Ford thanked the Secchia Family on behalf of the Ford Family and reflected on the friendship they shared with Peter Secchia throughout the years. Foundation Chairman Mike Ford highlighted how Betty Ford embraced her marriage to Gerald R. Ford, was the rock of their Ford Family, and how her becoming First Lady was her defining opportunity to help millions of women throughout the country. Peter Secchia remarked how special Betty Ford was and how he always believed she would have a statue as part of the Community Legends Project. Following the remarks, Peter and Joan Secchia were joined in the statue unveiling by Susan Ford Bales, Steve Ford, and Mike Ford.